Although more famed for Formula One than its nightlife, Abu Dhabi has recently opened a number of great drinking venues. From rooftop lounges to quirky independent spots brimming with Middle Eastern charm, we list the best bars for a relaxed drink here. 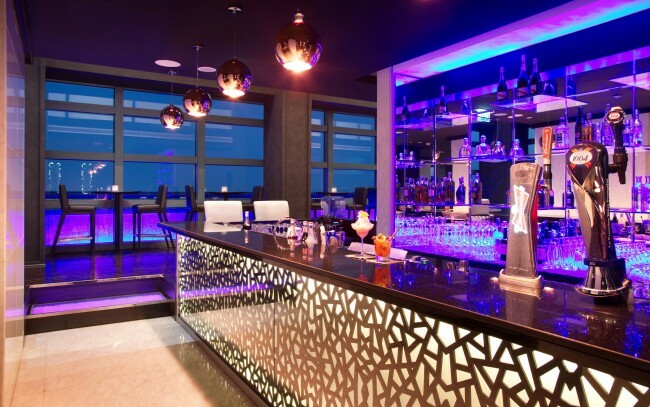 A local favorite, Skylite Rooftop Bar is located in the popular Yas Marina District, with a balcony overlooking a Formula One racetrack. The chic décor and tinted lighting here make it the perfect spot to take a date or small group of friends before heading out into the town. From Monday to Saturday there are themed specials and many drink discounts, and our favorite cocktail is the La Racasse, a house blend of Laurent Perrier Champagne, Courvoisier cognac, honey, orange bitters and lemon sorbet. During Formula one season the bar gets extremely crowded, so advanced booking is essential if you plan on visiting during peak time. Hemingway’s, one of Abu Dhabi’s most popular bars, sits a short ten minute walk from the city center. A Tex-Mex style pub with a warm and relaxed atmosphere, this is a popular spot for anyone looking for good food, great beer, and a range of sporting channels. Built in the 1980s, the venue recently underwent a modern refurbishment, equipping the interior with chic modern lighting and state of the art decor. A top food choice here are the delicious fajitas; try either the shrimp or the chicken and beef variety. The staff are extremely helpful and friendly, and are skilled in offering expert advice on what to do around the city. If you’re searching for a trendy open-air lounge in which to enjoy cocktails and good views, then Relax@12 is where you want to be. On a clear night here you can see for miles around, allowing visitors to bask in the beauty of the surrounding city. The oriental tapas is delicious, particularly the crispy duck crepes and drink specials are advertised daily from 5-7pm. With a convenient location in the National Exhibition Center, this is great choice for travelers looking to escape the heat of central Abu Dhabi. One of the best wine bars Abu Dhabi, a visit to La Cava offers customers a wealth of wine and whiskey options in a lavishly decorated setting. Located within one of the highest rated hotels in the city, Rosewood Abu Dhabi, the bar is characterized by quirky furniture pieces which include a chandelier made from 400kg of silver, and a long table carved from a single 200-year-old tree. A sampling of the extensive wine selection here is a must, a top pick being the Alsacian favorite Gerwürztraminer- Hugel et Fils 2011. Each Wednesday of the month La Cava’s head sommelier holds expert wine tasting sessions for 150 AED for those who want to know more about the vintages. Located in the Grand Millennium Al Wahda hotel, Porter’s Pub is a celebration of everything British, from the ales on offer, to the UK sports channels, to the quaint decor incorporating a London telephone box. Popular among the ex-pat community, this venue boasts a lively atmosphere, and the menu is renowned for its tasty dishes. The Flinstone burger is a particularly popular choice, be warned however that the portion sizes are not for the faint-hearted, so be sure to bring an eager appetite with you. A step into Cabana9 transports the traveller from the bustle of Abu Dhabi to the serenity of the French Riviera. Formally known as the Monte Carlo Beach Club, this private beach and pool venue is a favorite among locals looking to get away from the heat of the city. If time allows, purchase a weekend pass here, allowing entry to the beach and pool during the day and Cabana9 bar at night. The bar’s diverse wine collection is inspired by the French and Italian Rivieras; fill your glass with one of the specialty vintages from the Levant and watch the glorious sunset. Breeze at the hotel Dusit Thani sits beside a picturesque pool on the 23rd floor of the complex, itself continually voted one of the best places to stay in the city. Offering a selection of cocktails as well as fresh juices and smoothies, the bar also gives you the the option to order additional vitamin boosters with your beverage. They might boost your health but they won’t stop your hangover. The charming Cristal Champagne and Cigar Bar is pure Old Hollywood, with its glamorous decor, old-fashioned cocktails, and a jazz pianist. The bar also hosts innovative themed evenings, with Wednesday Wine and Dine being particularly popular; tasty cured and smoked meats paired with a wine of the diner’s choice. The Jazz and Fizz Bar is an unmissable late night experience in Abu Dhabi, offering great service, exquisite decor, and first-rate cocktails. The Espresso Martini available here is divine, and if you’re feeling particularly indulgent, one of the bar’s High Fashion Signature Cocktails costs from 90- 200 AED, but is worth every penny. Another popular option is the Gold Sour, which blends Johnnie Walker Gold Reserve, lemon juice, honey and real flakes of gold. Nightly live music, DJs and themed evenings such as Stiletto night and Men’s Night never fail to draw in the crowds. Dress to impress when visiting; there’s a strict dress code. It’s easy to see why Ray’s Bar is one of the most popular drinking spots in Abu Dhabi. With a 62nd floor location, the elevated site allows customers to soak in the views whilst sampling specialty Asian tapas; top picks include the Robata, a selection of teriyaki glazed chicken and beef rolls. Treat yourself to a glass of pink champagne to wash it down.